The success of Pocket Mindfulness has been overwhelming. At its peak, the first edition reached #1 in the “Spirituality” category on Amazon Kindle, and continues to find its way to all corners of the globe. Having received many requests for an eBook version of the series, I am pleased to offer the books for download in PDF format here on my blog. The concept of Pocket Mindfulness is to present this spiritual way of life in a concise, easy-to-understand manner. My mission is to help you become purposefully present in your daily life, which in turn will help you cultivate a purer awareness of the true nature of things. Mindfulness isn't an exclusive spiritual club for enlightened beings, and certainly isn't restricted to Buddhist or Zen scholars. I'm an everyday person like you, simply passing on the knowledge I've learnt during my life journey so far. I hope this series will assist you in discovering a deeper self-unity and profound loving connection with the world, and that the words will positively change how you think and feel on a daily basis. Through 15 eloquent, short chapters, this first volume defines key areas of mindfulness practice, offering instant inspiration, spiritual release and the motivation to truly let go and live in the present moment. Poetic in its structure, each sentence is carefully crafted, simplifying the beauty of this ancient, spiritual pathway to a more fulfilling, happier life. Pocket Mindfulness comprises a concise resource that can be referenced at leisure for social quotation and sharing with other learners, students and teachers. It is ideal for beginners and existing mindfulness practitioners requiring a profound reference guide. Click here to read a sample of Pocket Mindfulness Vol. 1. 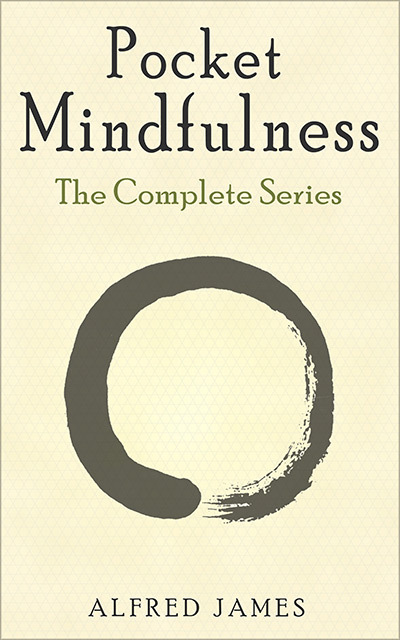 The second volume explores why mindfulness practice is essential in cultivating mental stability in daily life, comprehensively detailing how the grasping mind causes us to encounter such difficulty in finding true contentment. In these higher-level teachings, I explore how desire, attachment and aversion cause stress, anxiety and general mental suffering, and how mindfulness practice helps us tame the ego, reconnect with the purpose of our existence, accept the inevitability of death and share loving-kindness in the world. This second book stands alone as a must read for all those with an interest in furthering their understanding of mindfulness. Click here to read a sample of Pocket Mindfulness Vol.2. This third and final volume is a comprehensive guide to meditation, in which I explain how regular practice assists in stabilising the mind and ensuring we remain fully present and conscious in daily life. By the end of the book, you'll understand the true purpose of meditation, and how you can use this ancient practice as a holistic tool to relieve the suffering caused by the sporadic, unreliable projections of the mind. I provide practical examples of how to meditate using the breath, objects and sounds to centre the mind and overcome distraction, and offer rare insight on what if feels like to experience a true state of meditation. Click here to read a sample of Pocket Mindfulness Vol.3. Each book comes in PDF format, compatible with all digital devices. Your books will be delivered to you immediately via an instant download link. Your purchase is covered by a 60-day money back guarantee. Your payment is securely processed by Clickbank, the web's leading digital payment processor. **If you experience any difficulty with your download, or require a new download link at anytime, simply drop me an email here. I hope you find inspiration and peace within this book.